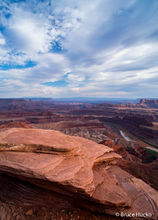 Dead Horse Point is a gem among gems of public lands in Utah. 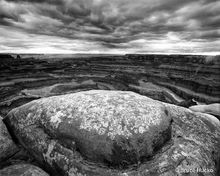 It was once slated to be part of Canyonlands National Park but was left out. If you venture to Island-in-the-Sky you owe yourself the treat of visiting DHP as well. You can walk from the sunrise to sunset side of the promontory in 10 minutes. It's a great place to watch storms come and go! See my photos of Super Bowl Sunday (2015) It's also a great place for a wedding!